Look out for road closures, parking bans, bus detours, station closures, and more. It’s time for the one annual day that causes Bostonians to be amazed by the herculean effort it takes to get from A to B. And, of course, the nearly 30,000 marathon runners are awe-inspiring, too. Multiple agencies, as well as the Boston Athletic Association, have announced information about traffic and service changes surrounding the 123rd Boston Marathon this Monday, April 15. Those who choose to drive near the course can expect to encounter road closures, detours, and parking restrictions. Those who take public transportation can expect rerouted buses, closed subway stations, and busy train cars. Either way, if you’re planning to get around on Marathon Monday, allow for ample time to reach your destination. The MBTA provided this service map along the route, and the BAA has a helpful list of anticipated closure times by locale. – Ashland from 7:15 a.m. to 1:45 p.m.
– Brookline from 9 a.m. to 5:15 p.m.
– Boston until 6:30 p.m. In Boston, street closures and parking bans wind through Brighton, Kenmore Square, and the Back Bay. For more details, refer to this thorough list of Boston road closures. The MBTA’s Copley Station will be closed all day Monday. The Berkeley Street entrance at Arlington Station will also closed. The Green Line will have a few additional station closures from 10 a.m. to about 6 p.m.: South Street (B branch), Kent Street (C branch), and St. Mary’s Street (C branch). All subway lines will operate on a regular weekday schedule with rush-hour levels of service before and after the race. 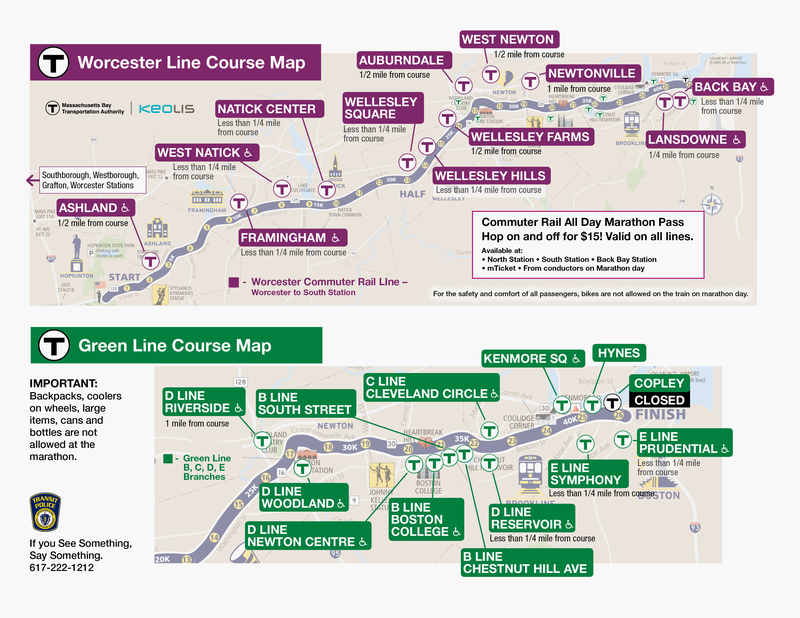 For more information on marathon closures, check the MBTA website. The commuter rail will operate on a regular weekday schedule, and the MBTA will include five additional trains on the Worcester Line and five additional stops at Boston Landing. Buses may be detoured or delayed during the marathon. Check bus service alerts for the most current information. Bikes are not allowed along the route, according to the BAA. Bikes, including folding types, will not be permitted on any MBTA vehicles due to the high ridership. For more prohibited items, check out this list.